Banking is still the career of choice for the majority of MBA students — but the percentage of those choosing it is dropping. The financial training provider Training the Street has been surveying MBA students since 2010 on which type of firm would be their preferred employer. This year, 26.28% of students surveyed chose large bulge-bracket banks or global financial institutions — down from 37.5% in 2010, although up from 25.26% last year. The percentage of respondents interested in working in private equity also declined for several years, before picking up slightly since 2014. It came in at 13.65% this year, down from 18.4% in 2010. 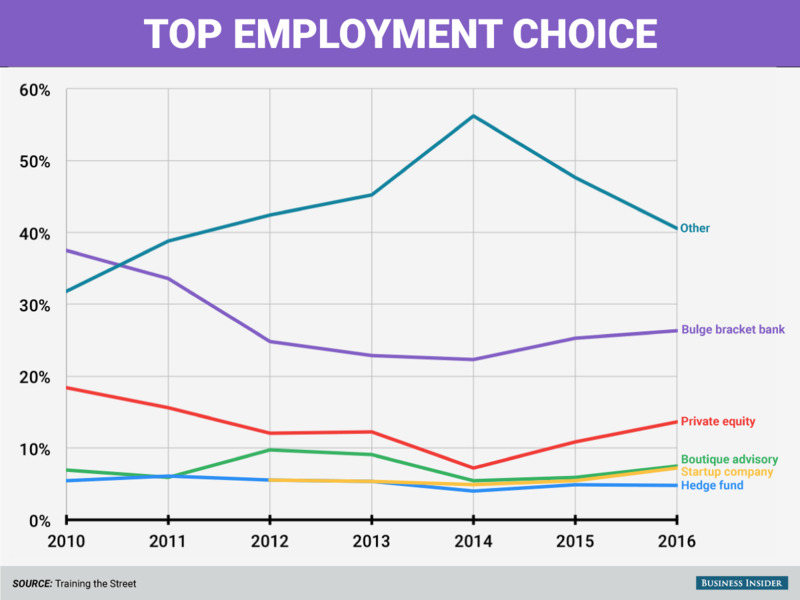 Startup companies have gained in relative popularity since Training the Street added them to the survey as an option in 2012. 7.17% of respondents chose startups this year, up from 5.5% in 2012. 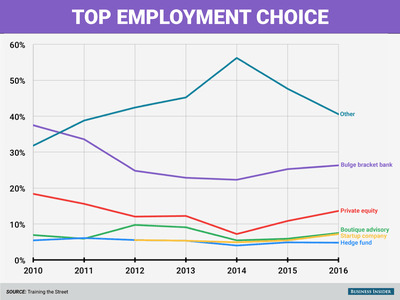 Most of the finance- and Wall Street-related career options saw a drop-off in popularity in 2014. That coincided with an increase in popularity in other types of firms, including “corporate development within a Fortune 2000 company” and, more significantly, consulting firms.